designed by Lou Cable and various photographers. Route 20 of the Blue Heron Scenic Route is located on the northern Gulf side of the Island, west of Cavendish and east of Malpeque Bay. This 30-kilometre stretch of secondary road leads to New London, birthplace of Lucy Maud Montgomery. The River Valley Scenic Drive runs along two rivers, the Madawaska and the breathtaking St. John, encountering many different types of scenery. In the heyday of New France, the route was the first line of communication between Quebec and the Bay of Fundy. The Dempster Highway links southern Yukon communities with Inuvik and the Mackenzie Delta in the Northwest Territories. It winds through two mountains ranges, the Ogilvie and the Richardson, and is the only public road in North America to cross the Arctic circle. The Dinosaur Trail is a 48-kilometre loop around the Red Deer River west of Drumheller through the fossil-rich badlands of the Valley of the Dinosaurs. The Tyrrell Museum of Palaeontology, Canada's only institute exclusively devoted to exhibitions and study of prehistoric life, was established in this area in 1985. These are very successful designs. I love the combination of elements. So do I: not only the combination 'men-nature' by highways and scenery, but also both the animals and fern in front, and the maps and road signs! That is a very tempting invitation to take a drive. 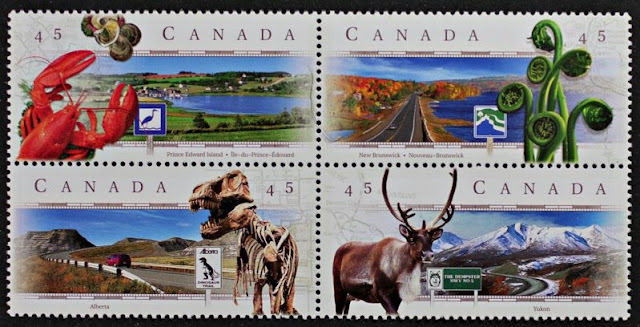 I like all of these, but the moose especially.